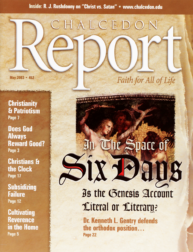 Helping Christians apply the Word of God to all | Chalcedon Foundation In the Space of Six Days: Is the Genesis Account Literal or Literacy? In the Space of Six Days: Is the Genesis Account Literal or Literacy? The battle of time has been between Christ and Satan. However determined the battle, the victory is assured, a predestined one recounted in the Bible. But neither Satan nor his followers believe in predestination by the sovereign and triune God, and therefore plan on and work towards victory. Man's sin nature makes him prone to believing the error that he is able to please God unaided. Man's first sin was yielding to Satan's temptation "to be as gods," knowing, or determining for himself, what was good and what was evil. With American troops involved in military action in foreign lands, many Christians are struggling with the concept of war. One young Christian wrote recently that he had no trouble with the idea of losing his life on behalf of his wife and his country. His real struggle is with the idea of taking a life. The financial status of many states in the U.S.A. is not good. There is never enough money to go around while expenditure exceeds income, which is the problem that many states have. The great Reformer John Calvin asserted that "God himself took the space of six days" to create the world. In recent issues of the Chalcedon Report we have been investigating America's central bank, the Federal Reserve Bank and America's (first) and (second) Banks of the United States.